The end of the Cold War and the collapse of the Soviet bloc have created new regional security challenges and several conflicts at the edges of the European Union. 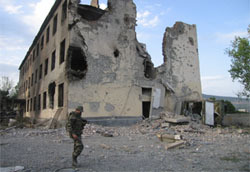 The wars in the Balkans in the 1990s, the Kosovo issue up until proclamation of independence on 17 February 2008 and the troubles in the Caucasus illustrated by the clash between Russia and Georgia in the summer of 2008 have all been studied by GRIP from the viewpoint of the European Union’s foreign policy. The internationalisation of conflicts connected with the ‘war on terror’ led by the United States in Iraq and Afghanistan, and the implications for the European Union are also a focus of GRIP’s research. 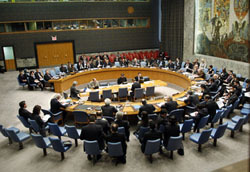 Security Council meeting during its consideration of the situation in Iraq. With the borderless economy developing and multipolarity becoming a reality, China has succeeded in taking the lead of a dynamic that pushes Asia ever more to the centre of the global geopolitical landscape. In the Asia-Pacific region, such a development constitutes a dramatic challenge to regional stability, as Beijing’s long-term strategic ambitions remain clouded with concerns and uncertainty. Countries faced by this destabilizing process have so far displayed quite a mixed response to the challenge. Among those, Australia has developed a composite policy that combines a targeted engagement of China with hedging and balancing behaviors, under the label of “middle power diplomacy”, one that aims to uphold its regional high profile. In this article, GRIP’s research fellow Bruno Hellendorff seeks to unravel Canberra’s rationale when engaging China and determine whether the current emphasis on multilateralism displayed by officials of both sides gradually supplants, complements, or barely overlays the traditional bilateral ties and mechanisms of power politics, and if the trend is likely to be sustained.